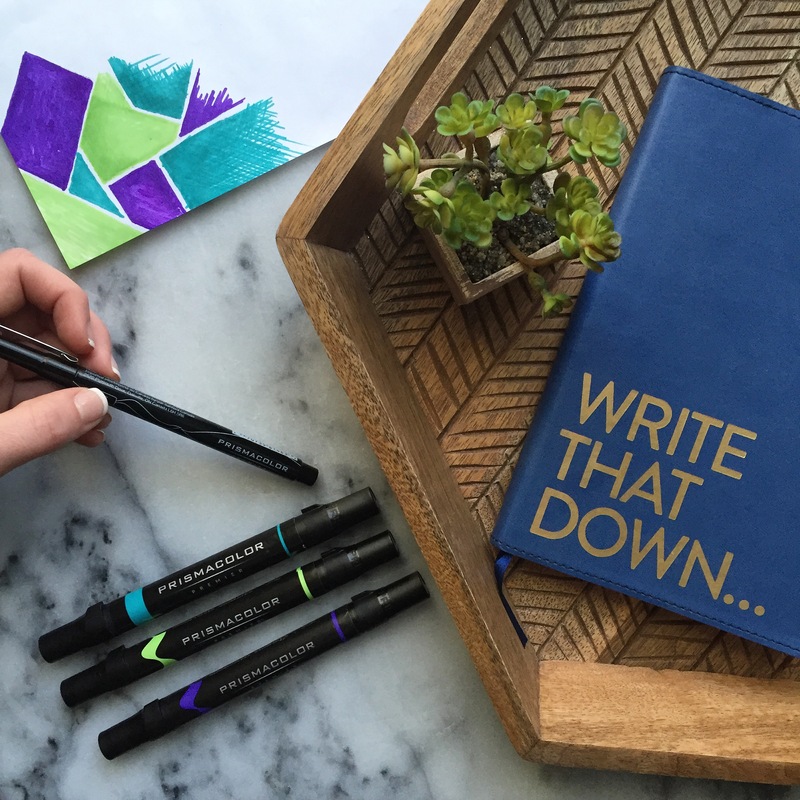 Have you you noticed the coloring trend lately?! 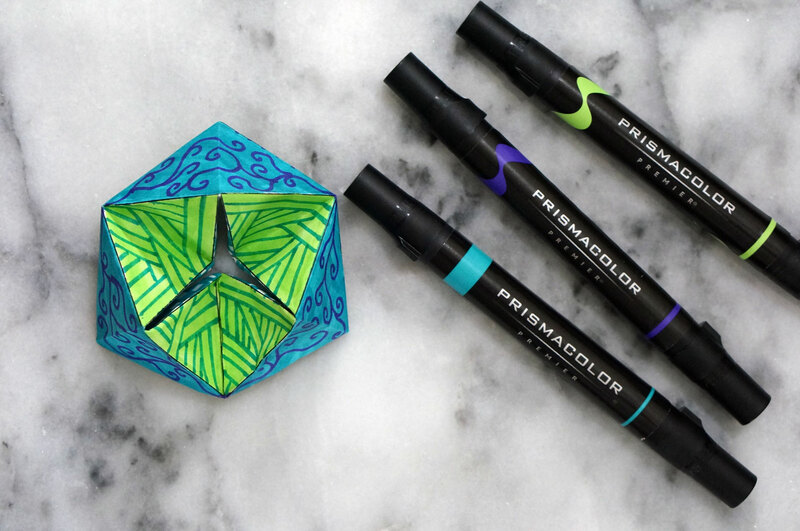 If you think that coloring is only for the kiddos, think again! The “adult-coloring” trend has grown in popularity this past year, and I decided to jump on the bandwagon. Although I have never lost my love of coloring, you typically don’t have as many opportunities to color as you get older. After hearing all of the wonderful benefits of adult-coloring, such as relaxation and mindfulness, I decided to sit down and complete one of my favorite coloring projects. I started my coloring adventure by heading over to Michaels Craft store, where I purchased Prismacolor Premier Illustration Markers (they are awesome because they have a ton of color choices, and each marker has two different sized tips on each end). If you are heading to the store make sure to check out Michaels coupons for additional savings, in newspapers and online! 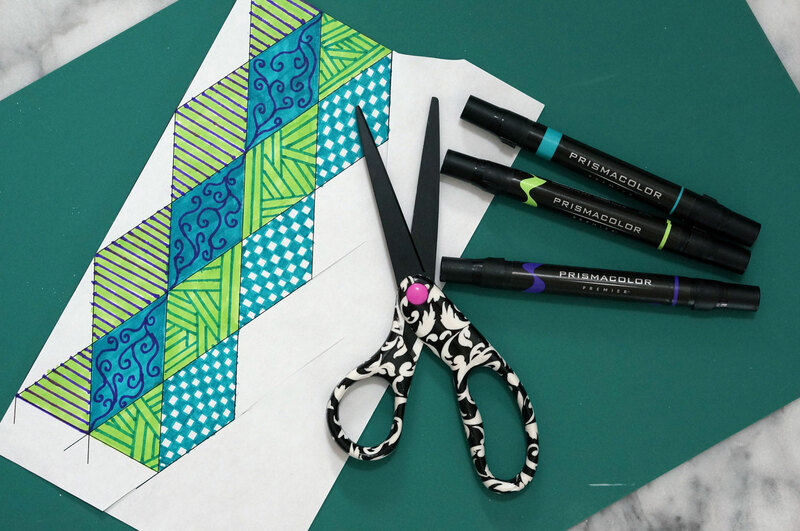 After printing out your kaleidocycle patten (click here to download pattern), start coloring! You can print it on normal computer paper or paper that is a thicker weight to make your kaleidocycle more hardy. Keep in mind that each row of diamonds is 1 ring in your kaleidocycle, so I like to do the same colors and similar patterns on each row of diamonds. Also make sure that you put an extra piece of paper underneath while coloring, because the markers can bleed through. The key is to create fun and bright patterns. I used my markers and a ruler to make my patterns, while mixing in some freehand. Jewel-tones are my favorite so I used the Prismacolor Premier Illustration Markers in the colors Violet, Aquamarine, and Spring Green. 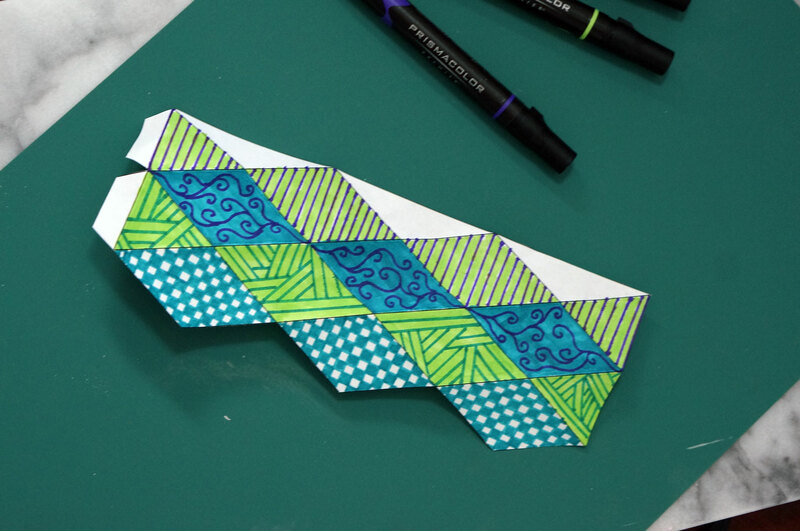 After you finish coloring, cut out your pattern as shown in the picture below. Next fold along all of the lines. 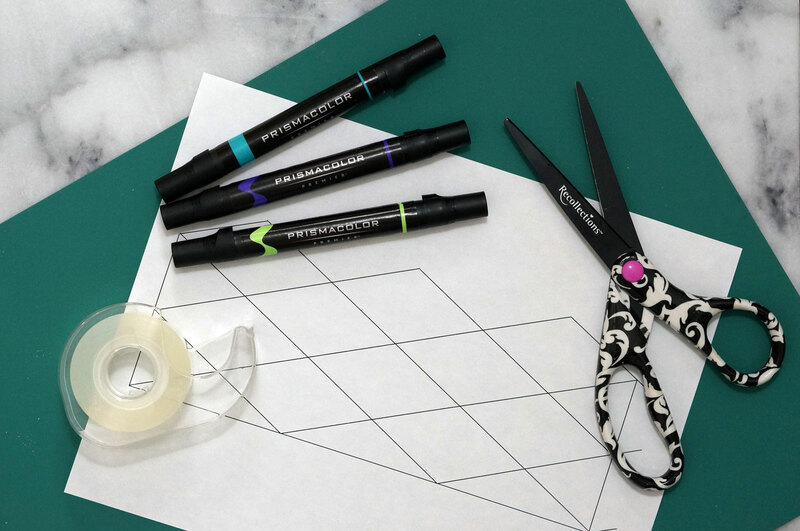 Make sure to create sharp creases. Next, fold horizontally across the center of each row of diamonds. Now for the tricky part. 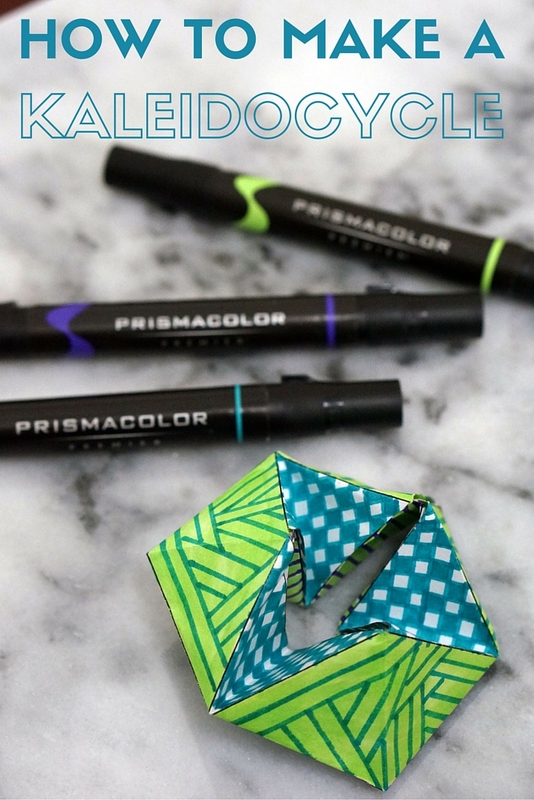 Fold your kaleidocycle into a weird looking tube shape and make sure all of the creases you folded are being utilized. 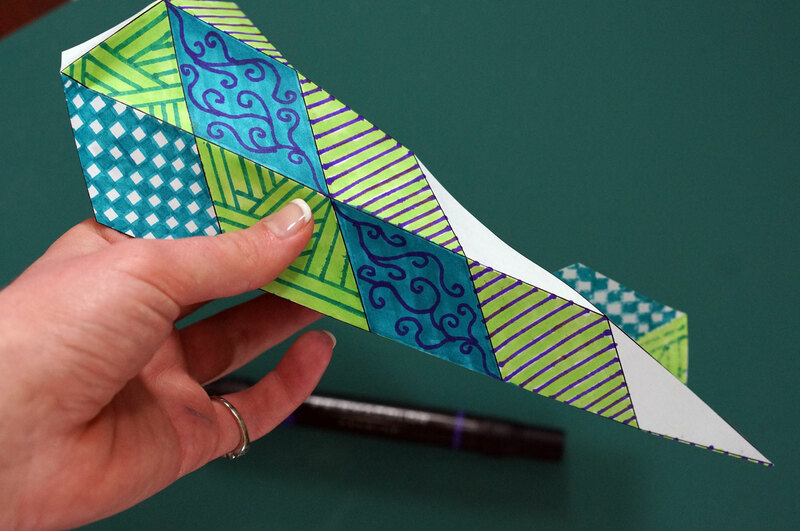 Then roll up your tape (to make it double sided), and put tiny pieces on the half-diamonds that you did not color. 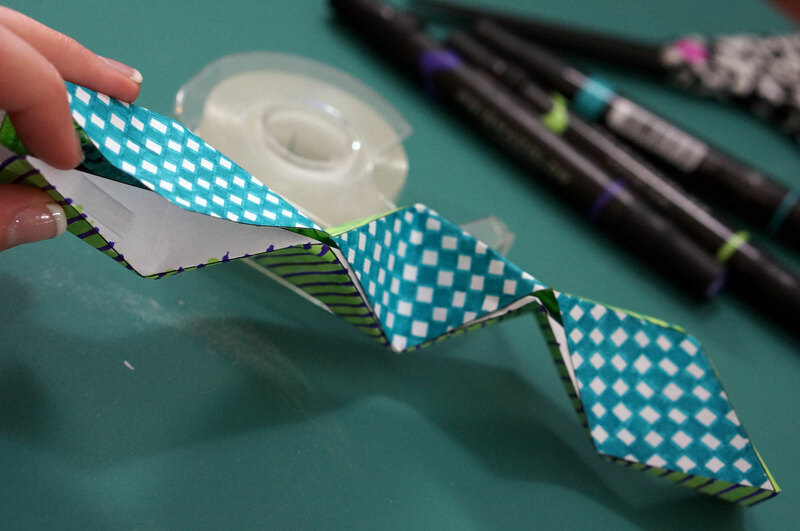 Then stick the final set of diamonds to the tape (as shown below). 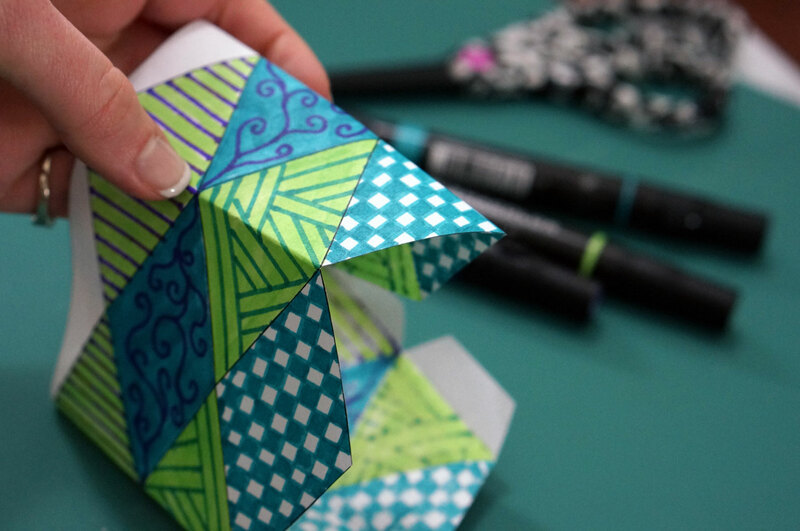 Next fold your paper into a circle shape to form your completed kaleidocycle, and use tape to stick the tab at the end inside, to form a closed-loop. 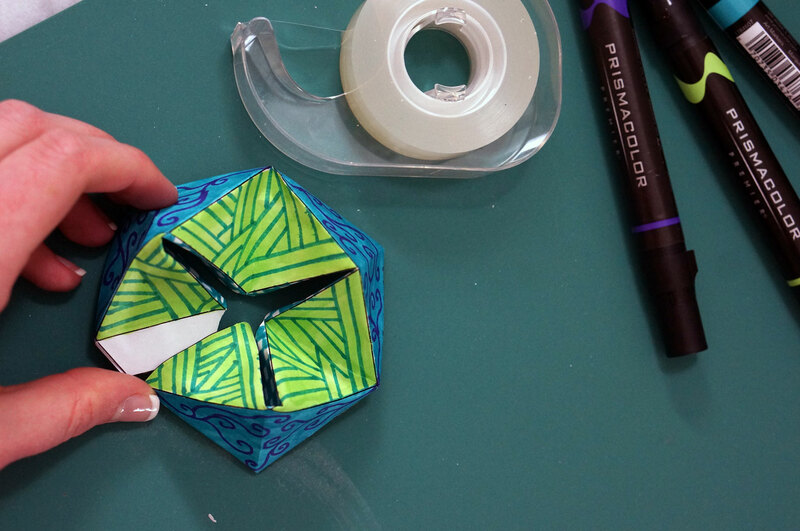 Once you get the tape to stick, take your kaleidocycle for a spin! Not only is the coloring therapeutic, but I also find spinning the kaleidocycle is a good form of stress relief as well. If you had fun with this coloring project and want more things to color, be sure to click here and select “free pages” to download your own free Prismacolor coloring pages! Great project for ALL kids, no matter your age! I love your Kaleidocycle Kristen!! Thanks! It is easier to make than you think and so fun to come up with the different patterns!